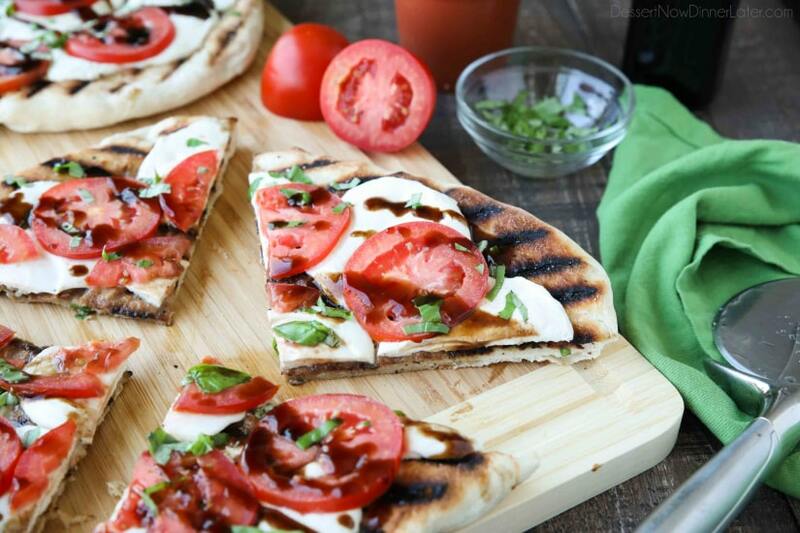 Grilled Caprese Flatbread - Dessert Now, Dinner Later! 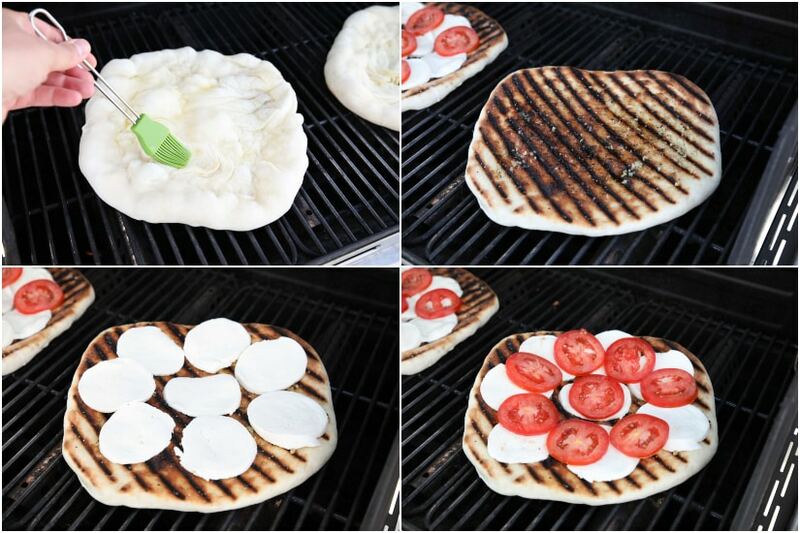 Grilled Caprese Flatbread makes a great summer dinner or appetizer. Freshly grilled bread is topped with mozzarella, tomatoes, basil, and garlic, then drizzled with a simple balsamic glaze. 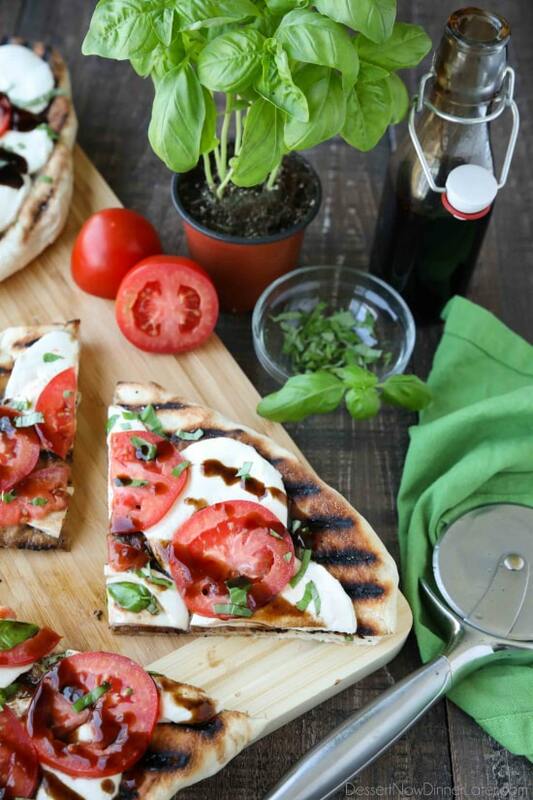 Savoring the flavors of summer couldn’t be easier with this Grilled Caprese Flatbread. 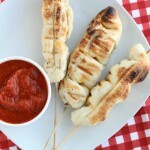 Grab those garden tomatoes and basil and this could be your dinner tonight! 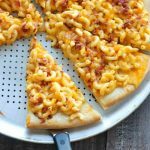 I’m always trying to think of quick dinners for summer. 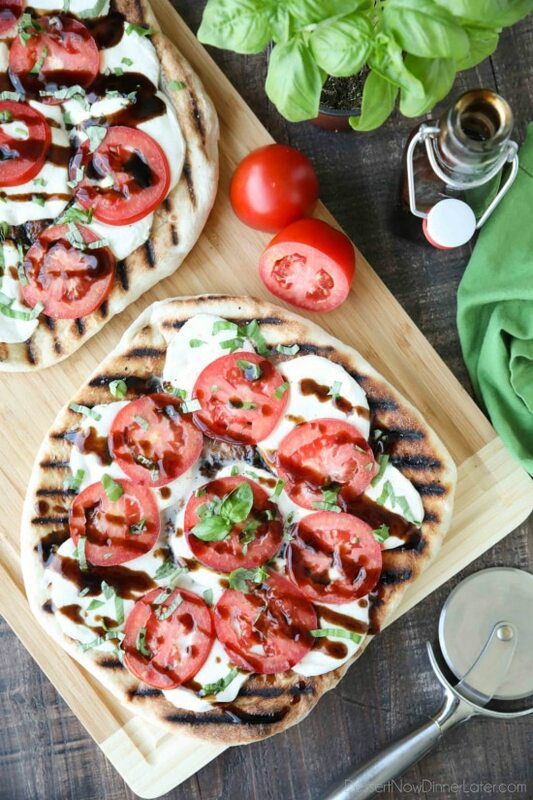 I just don’t like to cook when it’s hot outside, and this grilled caprese flatbread fits the bill. My toddler was even excited to eat it because it looks and smells amazing! I always use Rhodes White Bread for my homemade pizza. I like having fresh bread, and all I have to do is thaw it! 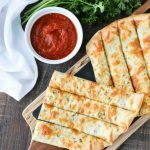 For this recipe, I cut the loaf in half and made two mini flatbread pizzas. You’ll brush one side with oil and place it oil-side-down on the grill. Brush more oil on the un-grilled (top) side, then flip it and add toppings. I spooned olive oil and garlic on top. Added freshly ground salt and pepper. Then topped the flatbread with slices of fresh mozzarella and tomatoes. Left it on the grill just long enough to melt the cheese a little bit, then topped it with fresh basil. The icing on the cake so-to-speak is the balsamic glaze drizzle on top. You can buy a pre-made, store-bought balsamic glaze, but it’s literally balsamic vinegar, water, brown sugar, and cornstarch. Easy! You’ll want to eat this right away because the fresh mozzarella is kind of wet and can make the crust go soggy if you let it sit on there for a while. 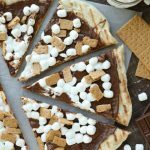 Don’t stop with just cooking dinner on the grill — have Grilled S’mores Pizza for dessert! *Place frozen dough on a greased baking sheet. Cover with sprayed plastic wrap and let thaw at room temperature for 4-5 hours. Cut dough in half. 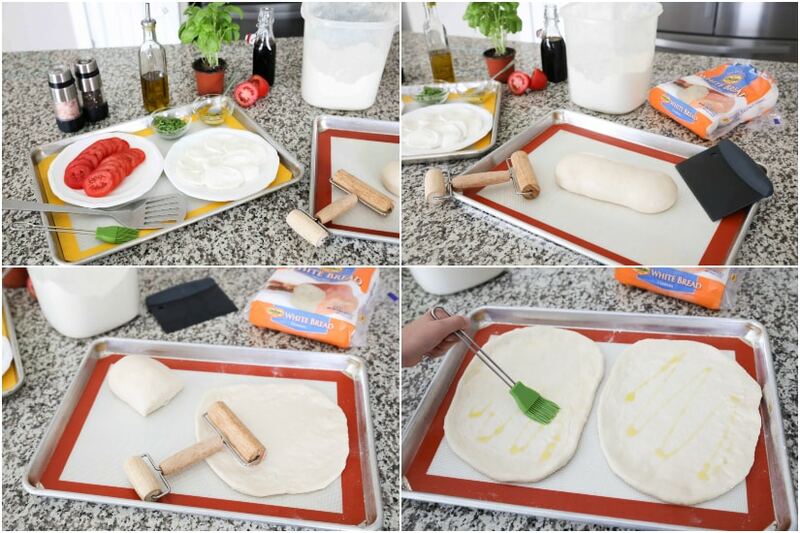 Roll each piece of dough into a circle. Use a little flour to keep it from sticking, if needed. Place 2 Tbsp of olive oil in a bowl for brushing the dough, and the other 4 Tbsp in another bowl with the minced garlic. Preheat a gas grill until nice and hot, then turn the heat down as low as it will go. Brush oil on one side of each dough. Place the oil-side-down onto the grill. Cook for 2-3 minutes, checking for the dough to look puffed, and golden brown on the bottom. Lightly brush the top side of each dough with oil, and flip it over. 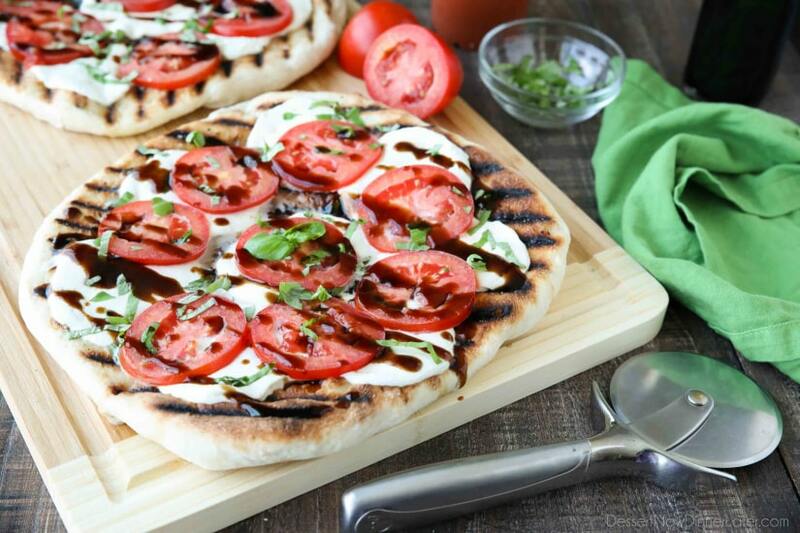 Remove flatbreads from grill and top with freshly sliced basil and drizzle with balsamic glaze. Slice and enjoy immediately. *TIP FOR THAWING: If you plan ahead, you can pull the frozen loaf the night before and keep it in the refrigerator until ready to use the next day.